Jul. 5, 2013 5:00 a.m. 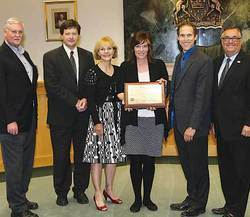 The City of Leduc received the 2013 Educational Award from CAMA (Canadian Assoc. of Municipal Administrators) in partnership with Leduc County and the Town of Beaumont for their jointly run Supervising For Results program.